Two weeks passed since the first time we started teaching K1 and K2 students at Wat Sapanteesam School. I can’t believe we are now approaching the third week tomorrow. The last two weeks brought joy and occasional tantrums from selected few. But that’s okay. It’s natural. Things are starting to get better now. I must admit I am also starting to get the hang of it. I don’t worry much about what to do with them anymore and on how am I gonna introduced a new lesson in a fun way. Everything is coming out naturally. By the way, Dr. Warong, Ajarn Lloyd, and yours truly had a meeting/dinner at a Thai-Chinese restaurant near the clock tower where Dr. Suwaree’s (wife of Dr. Warong) clinic was located. We talked about the sole purpose of the project and what outcome is expected. After an hour of conversation we were joined by Dr. Suwaree. The next day Dr. Warong and his crew paid the school a visit and observed Ajarn Lloyd’s class. According to Ajarn Lloyd everything went well. I’m sure it did. Let me tell you something the K2 adviser told me about Ajarn Lloyd. According to her (verbatim), “Ajarn Lloyd is so loving to the kids.” He surely is. Considering the fact that Dr. Warong wants every school in Thailand especially the temple schools where most poor students study to have English lessons without the need to enroll in the English Program in the future, I must say this project is really huge. 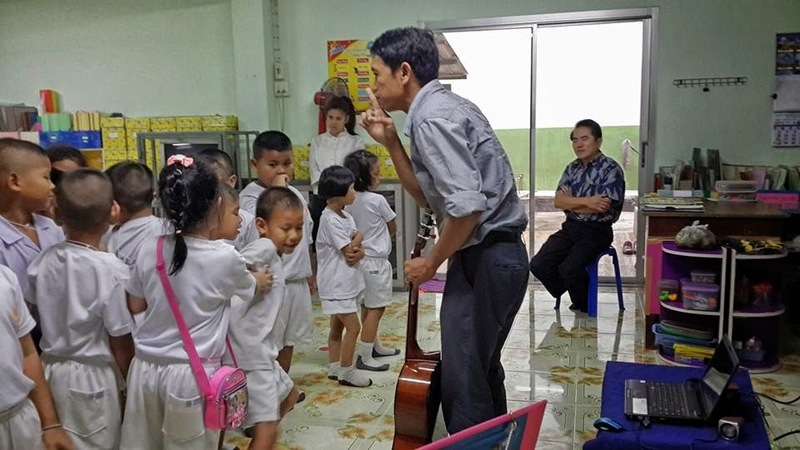 He hopes that in 15 years Thai people will be able to speak English fluently and confidently.